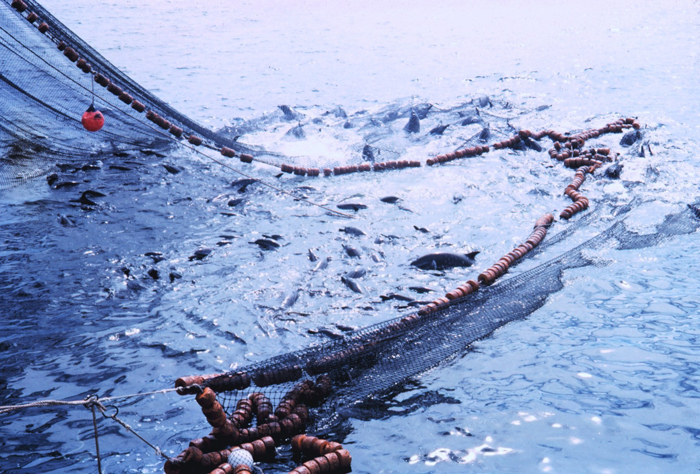 Purse seine. Photo by NOAA. As much as 54 per cent of the high seas fishing industry would be unprofitable at its current scale without large government subsidies, according to a new study by researchers from the National Geographic Society; the University of California, Santa Barbara; Global Fishing Watch; and the Sea Around Us project at the University of British Columbia and the University of Western Australia. The research, published today in the open-access journal Science Advances, found that the global cost of fishing in the high seas ranged between $6.2 billion and $8 billion in 2014. Profits from this activity range between a loss of $364 million and a profit of $1.4 billion. The high seas — marine waters beyond national jurisdiction — cover 64 per cent of the ocean’s surface and are dominated by a small number of fishing countries, which reap most of the benefits of fishing this internationally shared area. While the environmental impacts of fishing on the high seas are well studied, a high level of secrecy around distant-water fishing had previously precluded reliable estimates of the economic costs and benefits of high seas fishing. However, newly compiled satellite data and machine learning have revealed a far more accurate picture of fishing effort across the globe at the level of individual vessels. “The reason most fleets continue to operate in the high seas is that they receive government subsidies. Without subsidies and the forced labor some of them are known for, fishing would be unprofitable in over half of the high seas fishing grounds,” said Enric Sala, National Geographic Explorer-in-Residence and lead author of the study. Using Automatic Identification Systems (AIS) and Vessel Monitoring Systems (VMS), the researchers were able to track the individual behavior, fishing activity and other characteristics of 3,620 vessels in near-real time. Combining this information with the global catch data from the University of British Columbia’s Sea Around Us project, the team was then able to determine how much effort the vessels put on, how large their catch was, and how much profit the catch generated. “Satellite technology, computing power, and machine learning are rapidly transforming our ability to monitor and understand human activity at sea. This unprecedented level of transparency provided by Global Fishing Watch not only creates new research avenues but, more importantly, opens the door to exciting opportunities to improve how we manage and protect our oceans,” said Juan Mayorga, marine data scientist for Pristine Seas. “In many parts of the high seas, subsidies are propping up fishing activity to levels far beyond what would otherwise be economically rational. This implies that through targeted subsidy reforms, we could save taxpayers money, rebuild fish stocks, and eventually lead to higher value, lower volume fisheries,” said Christopher Costello from UC-Santa Barbara. The paper also hints at the possibility of individual fishing companies catching more than they report to fisheries agencies, hence making more money than they claim while still pushing governments for subsidies. “The Sea Around Us has already reported that global catches are 30 per cent larger than those reported by the Food and Agriculture Organization on behalf of countries. This means that, in many locations, the current level of fishing pressure is higher than we think, is depleting fish stocks and, on top of that, is not economically rational,” said the Sea Around Us Principal Investigator, Daniel Pauly. Beyond subsidies, unfair labour compensation or no compensation at all are key cost-reducing factors in long-distance fishing. “This phenomenon manifests itself both at sea, through forced labour, and on land through the use of child slavery. Some high sea fisheries, such as those exploited by China and Taiwan, are profitable only after assuming government subsidies and low labour costs,” added Dirk Zeller, head of the Sea Around Us – Indian Ocean at the University of Western Australia. The paper “The economics of fishing the high seas” is now online in Science Advances DOI: 10.1126/sciadv.aat2504.